Bodies build in the kitchen, sculpted in the gym! I’m not just the owner.. I’m a client, too! I truly believe, if you want to motivate others… you must practice what you preach and lead by example. I personally practice my company’s core principles daily and I am a product of the results. By choosing Perfectly Portioned Fitness you will receive a passionate professional trainer that will be by your side every step of the way. I will provide you with a customized program that will be the key to your success. We will be 100% focused on you and you goals. I am a certified personal trainer and a certified specialist in fitness nutrition. I love what I do! I love helping others. I started Perfectly Portioned to save myself. To keep me accountable for my fitness needs as I help other with theirs. 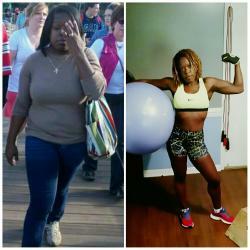 I am decade in changing lifestyle for individuals helping them reach their fitness goals. Your goal is my goal, so I take great pride in getting results. I am not your typical trainer, you will see me working out with my clients.